Franklin Solomon Hinshaw5 [Frank Solomon Hinshaw4,6,7,8,9,10,11, Franklin B. Hinshaw12]. Hinshaw, Frank, head-of-household, age 30, born in Kansas; parents born in Indiana; first marriage, married 6 years; occupation: farmer, farm; owned farm (free). Hinshaw, Minnie, wife, age 24, born in Ohio; father born in Ohio; mother born in Pennsylvania; first marriage, married 6 years; 3 children, 2 living. Hinshaw, Harold, son, age 5, born in Kansas; father born in Kansas; mother born in Ohio. Hinshaw, Lowell, son, age 3, born in Kansas; father born in Kansas; mother born in Ohio. Hinshaw, Franklin, head-of-household, age 39, born in Kansas; parents born in Indiana; rented farm; occupation: farmer, farm. 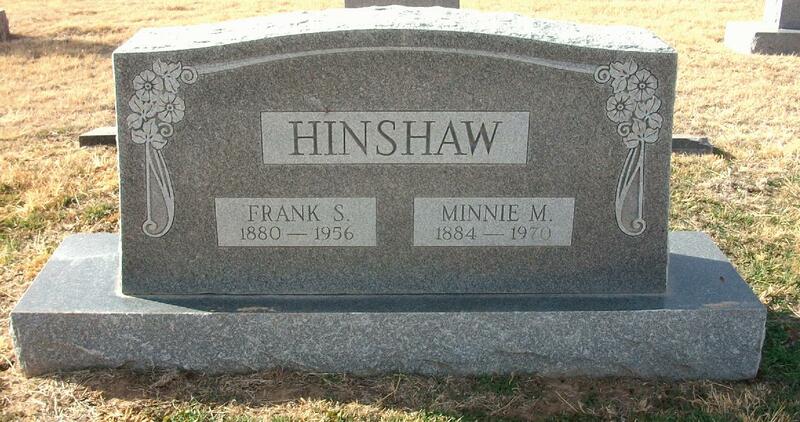 Hinshaw, Minnie, wife, age 35, born in Ohio; father born in Ohio; mother born in Pennsylvania. Hinshaw, Hearold, son, age 15, born in Kansas; father born in Kansas; mother born in Ohio; attended school. Hinshaw, Lowell, son, age 12, born in Kansas; father born in Kansas; mother born in Ohio; attended school. Hinshaw, Myrle, daughter, age 8, born in Kansas; father born in Kansas; mother born in Ohio; attended school. Hinshaw, Frank S., head-of-household, age 44 [unclear], born in Kansas. Hinshaw, Minnie M., wife, age 39 [unclear], born in Ohio. Hinshaw, Harold F, son, age 19 [unclear], born in Kansas. Hinshaw, Lowell U, son, age 16 [unclear], born in Kansas. Hinshaw, Myrland, daughter, age 11 [unclear], born in Kansas. Hinshaw, Frank, head-of-household, age 49, born in Kansas; parents born in Indiana; first married at age 24; rented home; radio in home; occupation: farmer, general farm; not a war veteran. Hinshaw, Minnie, wife, age 45, born in Ohio; father born in Ohio; mother born in Pennsylvania; first married at age 20. Hinshaw, Harold, son, age 25, born in Kansas; father born in Kansas; mother born in Ohio; occupation: farmer, general farm; not a war veteran. Hinshaw, Myrland, daughter, age 18, born in Kansas; father born in Kansas; mother born in Ohio; attended school. Hinshaw, Lowell, son, age 23, born in Kansas; father born in Kansas; mother born in Ohio; attended school. Hinshaw, Frank, head-of-household, age 59, born in Kansas; completed 7th grade; on Apr 1 1935 was living in Haviland, Kiowa County, Kansas; rented farm ($300/month rent); occupation: farmer, farm. Hinshaw, Minnie, wife, age 55, born in Ohio; completed 3 years of high school; on Apr 1 1935 was living in Haviland, Kiowa County, Kansas. 1910 census, Ivanhoe Township, Finney County, Kansas; roll T624-439, ED 44, page 6A, line #10, dwelling #2, family #2. 1920 census, Lincoln Township, Edwards County, Kansas; roll T625-530, ED 38, page 11B, line #84, family #84. 1925 Kansas state census, Lincoln Township, Kiowa County, Kansas; roll KS1925_72, dwelling #23, family #23. 1930 census, Union Township, Kiowa County, Kansas; roll T626-706, ED 13, page 2A, line #42, dwelling #29, family #29. 1940 census, Evans Township, Kingman County, Kansas; roll T627-1238, ED 48-14, page 3B, line #74, household #48.